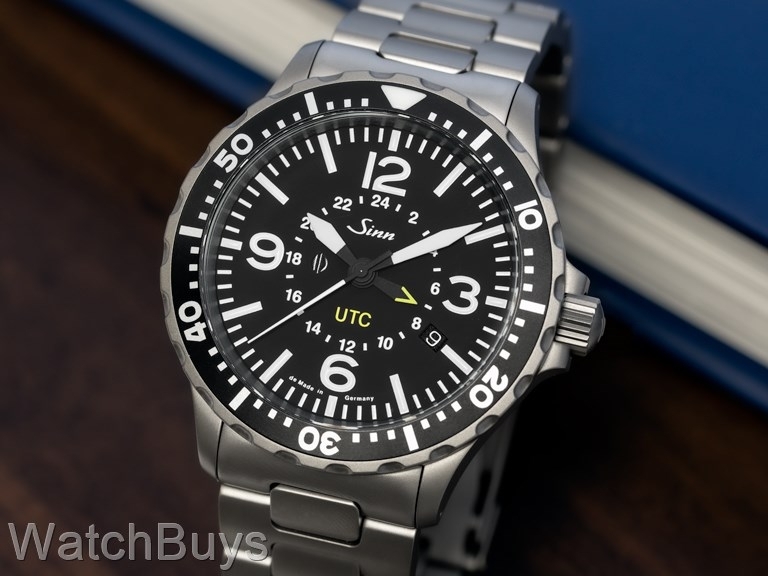 To create this watch, Sinn built on the extremely popular design of the Sinn 856 UTC dual time zone watch and a new case size and bezel. On a frequent basis we receive client praise for Sinn's "Tegiment" (hardening) technology, and have heard quite a few stories of watch cases scraped against metal railings, car doors, metal desks, and other more interesting objects with little to no damage to the case. Standard steel used by most watch companies has a hardness of between 200 and 240 HV (Hardness Vickers is a common scale used to measure material hardness). 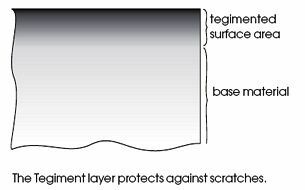 The Tegiment layer has a hardness of 1,200 Vickers which is up to five times harder than standard steel. The Tegiment layer is not a coating consisting of a foreign material, instead the steel itself that has been hardened using a special engineering process that creates a hardened barrier. The base material is a type of stainless steel also used for surgical implants, and the stainless steel resistance to corrosion is even further improved by the Tegiment hardening process. The case back is nickel free, perfect for those with allergic reactions to case metals. Other features include protection from magnetic fields of up to 80,000 A/m, sapphire crystal with anti-reflective coating on both sides. 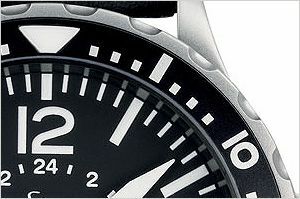 Another Sinn engineering feat is the creation of a bezel that is secured by screws. The inlaid aluminum ring featuring numerals and markers is anodized black for optimal legibility, while the triangle reference marker at 12 is applied with special paint for visibility. The case features a copper sulphate capsule which reacts with moisture to diffuse and absorb humidity in the watch. This capsule may be viewed through a porthole in the left lug, and over time will turn a deep blue as humidity is absorbed. This technology not only provides a more stable environment for the movement, but also helps to prevent fogging of the crystal when going from hot to cold environments or from humid to non-humid conditions (such air conditioned buildings). This watch has a second time zone displayed by a skeleton yellow tipped hour hand. The second time zone can be set directly through the second position of the crown and uses a 24 hour indication to differentiate AM and PM. Sand-blasted stainless steel case with solid back. Dial is matte black with Arabic numerals and offset date display at 4. The design and layout of this watch make it extremely easy to read in virtually all light conditions. Sapphire crystal with luminous hands, hour markers and the 12. Watch is water resistant to 20 ATM. Watch is fitted with a Tegimented steel bracelet with hex screws and solid end links. Other features include Sinn's Dehumidifcation Technology which uses inert gas to reduce humidity and to prevent the dial from fogging. 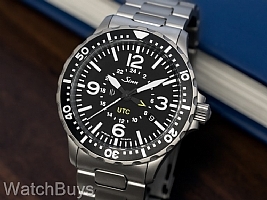 "857 utc ultimate everyday timepiece"
Verified Owner Comments: I have worn this watch every day for 2 years, in my collection I don't have anything that is as hard wearing or beautifully utilitarian! The styling is slightly confused , divers and pilots but I actually prefer this to my Rolex Sub! Beautifully made and it's one of those watches that people own that KNOW about good watches. Verified Owner Comments: I've been wearing this watch everyday for about 6 months and like it. Very nice size and weight. I bought the rubber (latex) band (large clasp) after the initial purchase and am impressed with it as well. The steel one was fine, was just looking for something different and the rubber one happens to hold the watch a bit more firmly on the wrist while mountain biking. I do wish the watch was easier to read in the dark. It has decent glow power but the hands are too similar in shape and size to be totally legible in the middle of the night. Overall, would recommend it though. Very well made. Verified Owner Comments: I have had this watch for 6 months now and I love it. I spent a lot of time looking for a rugged but classy sport watch, and decided on this one over an 856 to get to the right case size. I had some reservations about the bezel, but one thing worth mentioning is that the numbering is in gray, matching the case metal, so it doesn't "pop" as much as it appears to in the pictures. The yellow UTC hand is not unattractive or distracting. I wear this piece often, and the tegimented case is pristine. Looks great with a pebbled reddish-brown strap. If Sinn would "get the red out" of the U2 model, I'd buy it. Verified Owner Comments: I have had my 857 for about two years and wear it daily. There is almost no noticeable wear and tear. The clasp on the metal bracelet is the only piece that show signs that it is worn at all. It still catches the eye of watch enthusiasts who often ask who makes it and how nice it looks. I love this watch. That is the reason I have not bought more watches...I would still want to wear this one. Verified Owner Comments: I love this watch. There are very few true dual time-zone watches that have a diver-style bezel. This is one of them. The watch is an ideal military timepiece. The tegimented steel is also fantastic. Looks like titanium, but with a more solid feel. Also, watch is not too big. I also wear a Submariner, and have a relatively small wrist. I was worried it would be too clunky for me, but it's perfect. Verified Owner Comments: This really is a nice watch. If you are thinking about getting one, DO IT! It's well worth the price.